Does the Shroud of Turin show the "real face of Jesus"? That claim is impossible to judge, even though it serves the title of a documentary about the 3-D analysis of the Shroud of Turin premiering tonight on the History Channel. What can be said is that the centuries-old image wasn’t just painted freehand. Computer analysis of the imprint on the shroud suggests that it had to be left behind by someone draped in cloth. The Ethiopian Orthodox Church is one of the world’s oldest Christian traditions and still maintains practices unchanged from the early days of Christianity. 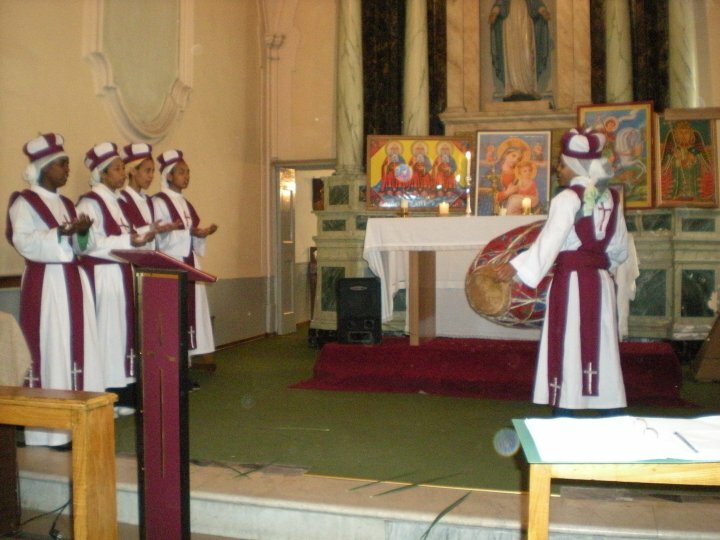 The Ethiopian church is the biggest in a communion of six Eastern Orthodox churches, which also includes the Coptic Church of Egypt, the Syrian Orthodox Church, the Armenian Orthodox Church, the Eritrean Orthodox Church, and the Malabar Orthodox Church in India. The Ethiopian Orthodox tradition is alive and well in the Vancouver area. Depicted above is the affirmation of the word of God, which involves ritual kissing of the Bible. 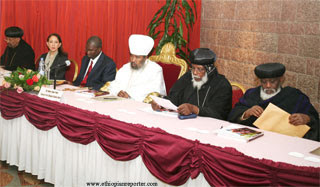 (Deje Selam; March13/2010):- The annual US Human Rights Reports has mentioned the Ethiopian Orthodox Tewahedo Church. Deje Selam singled out the Report's parts where the Church and religion is referred. Let us read this excerpt and discuss. "... On July 9, unidentified individuals beat Addis Neger journalist Abraham Begizew, who was attempting to report on a disagreement within the leadership of the Ethiopian Orthodox Church (EOC). On August 24, Asrat Wedajo, former editor of the now-defunct weekly Seife Nebelbal, was convicted in connection with a 2004 story alleging human rights violations against ethnic Oromos. The Federal High Court sentenced him to one year's imprisonment based on provisions of the Press Proclamation of 1992, notwithstanding that a new media law had superceded it in December 2008. In February 2008 police arrested Al-Quds publisher Maria Kadi Abafita, Al-Quds editor in chief Ezeddin Mohammed, and Salafia publisher and editor in chief Sheikh Ibrahim Mohammed Ali following their publication of articles critical of a Ministry of Education directive on religious worship in schools. On July 27, the Federal High Court acquitted Maria Kadi Abafita, fined Ezeddin Mohammed 10,000 birr ($800), and sentenced Ibrahim Mohammed to one year's imprisonment. 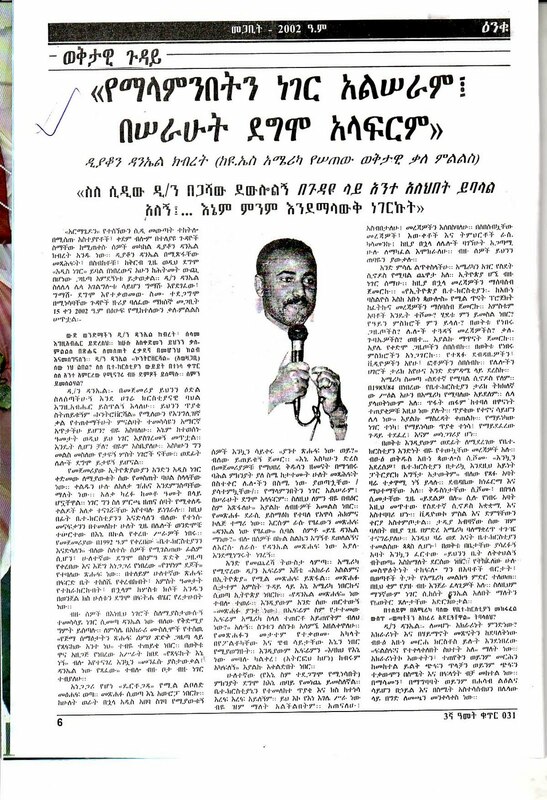 There were no developments in the March 2008 case of Dawit Kebede, editor in chief of the weekly Awramba Times, who was accused by the National Electoral Board (NEB) of violating the electoral regulations by posting an advertisement for his newspaper on a poster promoting EPRDF candidates for local elections. 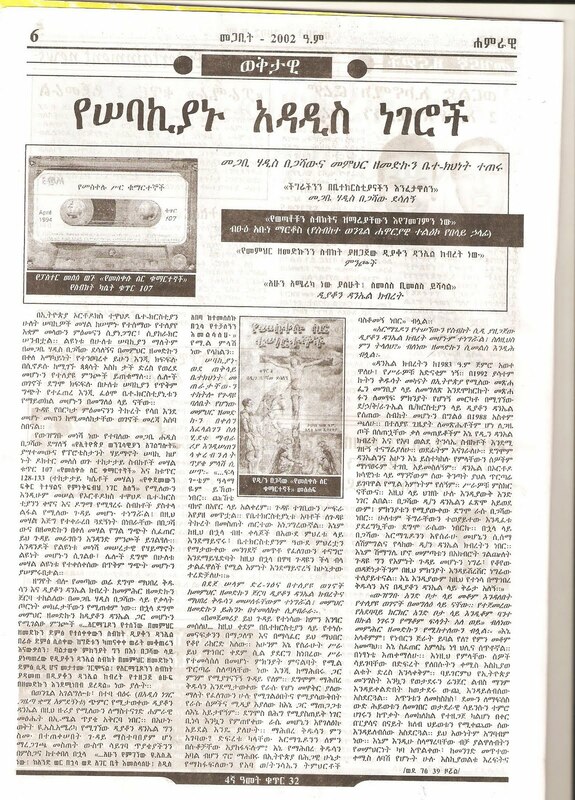 There were no developments in the May 2008 case of Alemayehu Mahtemework and three staff members of the private Amharic monthly entertainment magazine Enku. The government accused them of publishing "stirring articles that could incite people" and held them for five days before release. Alemayehu was also charged with threatening public order. The magazine continued operating during the year. In July the Federal High Court acquitted Addis Neger editor in chief Mesfin Negash of the defamation charges against him. In July 2008 the EOC had sued Mesfin for defamation in connection with the newspaper's reporting on an ongoing EOC embezzlement case. There were no developments in the August 2008 cases of Dawit Kebede and Wosseneged Gebrekidan, charged with inciting the public through false rumors for publishing articles about the Ginbot Seven, an opposition political group advocating change in the government by any means. Both were released on bail. The constitution and law provide for freedom of religion, and the government generally respected this right in practice; however, local authorities and members of society occasionally infringed on this right. The EOC and Sufi Islam are the dominant religions; 80 percent of the population adhered to one or the other faith. Religious organizations, like NGOs, must renew their registration with the MOJ every three years. The EOC and the Ethiopian Islamic Affairs Supreme Council (EIASC) did not reregister and did not face government sanctions, prompting some religious groups to complain of a double standard. In accordance with the CSO law, religious organizations that undertake development activities must register their development wings separately as NGOs and follow the strict new guidelines of the CSO law. Various religious groups seek the return of real property confiscated from them by the government between 1977 and 1991. In Addis Ababa and Oromiya, buildings that had been registered under federal statutes have been returned; however, structures registered under regional statutes were not returned. Unlike previous years there were no reports of minority religious groups reporting discrimination in the allocation of government land for religious sites. Authorities continued to ban Waka-Feta, a traditional animist Oromo religious group, because it suspected that the group's leaders had close links to the OLF. Protestant groups occasionally accused local officials of discriminating against them when they sought land for churches and cemeteries. Evangelical leaders charged that because authorities perceived them as "newcomers," they were at a disadvantage compared with the EOC and the EIASC in the allocation of land. On June 30, police in Dessie town (northeast Ethiopia) shot and killed Mesfin Worku, Dawit Defaru, and Bizuye Hussein, who were among a crowd demonstrating after being forced to stop unlawful construction of a church at a site that Muslims claimed was their burial ground. Several were injured in the ensuing violence. On July 7, the head of the Dessie EOC Diocese Aba Gebreselassie was arrested on charges of inciting violence. He was released on bail after seven days, and no future court appointment had been scheduled. No one was charged in connection with the three deaths. Orthodox and Muslim leaders in Dessie blamed the government for its nonresponsiveness in resolving the land dispute and for conveying conflicting messages to each side. In December 2008 police opened fire at a public gathering near a church in the southern city of Arba-Minch, wounding three individuals. Police were reportedly attempting to disperse a crowd following a disagreement between Orthodox priests. No arrests were made by year's end. In most regions Orthodox Christians and Muslims generally respected each other's religious observances, and there was tolerance for intermarriage and conversion in certain areas. However, there were some highly publicized religious conflicts that heightened tensions and precipitated government intervention. Some victims in these and other instances of religious conflict sought protection from local authorities. On January 8-10, a series of localized religious clashes in Dire Dawa in the eastern part of the country left one dead and 20 injured. In one neighborhood Muslim youth, reportedly angry about Israeli attacks on Gaza, threw stones at Christian youth who were singing religious songs in the street during the EOC Christmas holiday. Christian youth retaliated by throwing stones at Muslims until police intervened. These violent clashes spread from one neighborhood to another. The EIASC continued to express concern over the allegedly increasing influence of Saudi-funded entities within the Muslim community, which the EIASC blamed for exacerbating tensions between Christians and Muslims. On February 16-17 and April 23-24, the MFA held forums in each regional state, which included representatives from local government, security bureaus, and police commissioners, to build inter-religious understanding and resolve sectarian conflicts. The Jewish community numbered approximately 2,000, and there were no reports of anti-Semitic acts. For a more detailed discussion, see the 2009 International Religious Freedom Report at www.state.gov/g/drl/rls/irf...."
Not even Rommel's artillery could interrupt the prayers of Father Abd al-Masih. A round midnight, Abuna Abd al-Masih comes out of his cave in the Libyan Desert and stands with his hands held palm upwards in the same posture that the first Christians used when praying. His lips move as he looks up into the sky. Sometimes he kneels and touches the ground with his forehead. For the rest of the night he will continue his prayers and genuflections as he has been doing for the last 34 years. Abuna Abd al-Masih is a Coptic monk and he is 72 years old. Forty years ago, he walked the 1500 miles from his village in Ethiopia to the monastery of Baramous on the edge of the Western Desert, some 70 miles northwest of Cairo. He spent five years behind the high walls of this Egyptian monastery, distinguishing himself by the severity of his penances, until he found the company of the dozen other monks distracted him from his aim of total mortification. He decided, therefore, to go out into the desert which surrounds Baramous, to find his own cave, and to spend the rest of his life in complete solitude communing with his Maker. In those early days when he was younger, the Ethiopian hermit used to walk once a week three miles back to the monastery to get bread, beans, dates, and a jerrycan of water. Now that he is an old man, the monks of Baramous take his meager rations out to him. He exchanges ritual greetings with his brothers, but that is all. He wants to know nothing about what is going on in the outside world and has no interest in that world in any case. He refuses to see visitors, and the monks of the nearby monastery where I spent two days and a night were gently but firmly opposed to my approaching his cave..
"You monks should know that when you eat oil and fish (he is referring to sardines), the devil will visit you at night." I would very much have liked to visit Abuna Abd al-Masih, since he and several other hermits also living in caves in the region are the direct descendants of the famous anchorites of the Thebaid—of Saints Paul, Antony, Macarius, and thousands of other solitaries who peopled the Egyptian deserts in the third and fourth centuries of our era. To us in the western world, so totally oriented to a machine civilization, the very idea of a man living and thinking exactly as the Desert Fathers did 1600 years ago is almost incomprehensible. But standing that night on the ramparts of the monastery of Baramous and looking out across the silent wasteland, I did not find it so hard to understand. In fact, the monks were not in the least amazed by the spiritual feats of Abuna Abd al-Masih and the other "athletes of God," as the hermits used to be called. In the first place, the present patriarch of the Copts, His Holiness Kirellos the Sixth, 116th pope of the Egyptian Church and "spiritual head of the town of Alexandria, all the countries of Egypt, of Jerusalem, Nubia, Abyssinia, Pentapolis, and all the lands in which Saint Mark preached," was himself a hermit for 10 years while a monk at the Baramous Monastery. Yet when one meets the patriarch himself, sitting, as I found him, in his armchair beside his bed with a row of medicine bottles on the table nearby, one sees no marks of the extraordinary experience that he has undergone—an experience few other living men would care even to contemplate. It is not, then, surprising that his brother monks request Abuna Abd al-Masih to grant them the privilege of sharing his solitude, though the Ethiopian had now made it clear that he wants to spend the remaining years of his life alone in his desert retreat. But there are plenty of other caves in the cliffs of the Wadi Natroun; and according to the early historians thousands of hermits occupied them in the fourth century A.D. And even today, no Copt, whether monk or layman, would find it unusual if a monk should walk out of his convent to live alone in the desert for months, or even years. Alternatively, the brothers can mortify themselves within the confines of their own monastic cell, and Father David, my guide at Baramous, told me that the Ethiopians were renowned for the severity of their self-inflicted ordeals. One Abyssinian spent every night of his life, for 26 years, standing outside his cell, facing east, hands upraised, praying until the first rays of the sun came over the fortress wall. Others subject themselves to long fasts, though this is not in-the least unusual, since all must fast most of the time, particularly during the Coptic Lent, lasting 56 days. While I was visiting the Wadi Natroun monasteries, the rule prescribed only one meal of bread and bean soup a day. In some monasteries, masses are continuous throughout the 24 hours, the one I attended beginning at four o'clock in the morning and continuing to six. I envied those old monks who had a tau-stick, or crook, to lean on, as we stood most of the time. On the other hand, the service and ritual in these Coptic churches, several of which claim to be built on the site where the Holy Family rested on their flight into Egypt, are so fascinating that I did not mind standing. The prayers and lessons are recited in Coptic, the direct descendant of the ancient Egyptian language, so that what one is hearing is a faint echo of the speech of the Pharaohs. I don't imagine, however, that even a first-class scholar of Coptic would understand what was being said any more than the lay congregation, for Coptic to the Egyptian Christians (unless they are churchmen) is as incomprehensible as Latin to most Catholics. In any case, I never heard words issue from the mouths of men faster than the liturgy did from the lips of the officiating priests. Prayers and liturgies are accompanied by the clash of a cymbal and the tinkle of a triangle and shouts of "Kyrie eleison" repeated rapidly many times over. Life in the desert monasteries is not, however, all austerity, and it is certainly not as severe as it used to be when these remote citadels of Christianity were completely cut off from the outside world. Even 30 years ago, it took five or six days to reach the convent of Saint Antony on the Red Sea, for instance; and it was necessary until quite recently to organize a camel caravan to cross the desert west of the Nile in order to visit the four monasteries of the Wadi Natroun. Only a handful of travelers made the arduous and sometimes dangerous journey in the 18th and 19th centuries, and some of these enterprising explorers came back with the priceless manuscripts which now form the great collections in the national libraries of Britain, France, and the Vatican. The story of these "finds" by the Assemanis, Curzon, Tattam, Tischen-dorf, and others is in some respects discreditable to these travelers, and some commentators have gone so far as to call their activities outright looting of the monastery libraries. Certainly Robert Curzon in his Visits to Monasteries in the Levant (one of the best travel books ever written, but now out of print) relates how he plied the monks of Baramous and other monasteries with an Italian cordial called rosoglio, then practically helped himself to their rarest manuscripts, bundled them into his saddle bags, and hurried off. In this manner he got away with a unique gospel of Saint Matthew and Mark written on vellum by a monk called Sapita Leporos, a disciple of the great abbot Macarius himself. He acquired this manuscript in the monastery of Suriani, a neighbor of Baramous in the Wadi Natroun. Tischendorf's "scoop" in obtaining the Codex Sinaiticus (now in the British Museum) from Saint Catherine's is, of course, one of the great classics of book collecting. But those days are over. The situation of the monasteries nowadays is quite different from what it was when Curzon was ransacking the treasures of the libraries while the monks looked on slightly anesthetized on rosoglio. The convents are linked with the outside world by good roads, though the visitor needs a jeep or Land-Rover to reach some of them in the full desert. But roads, cars, telephones, transistor radios, and above all, tourists have introduced a new note into monastic life. Concessions have been made to modern attitudes as well as to modern machines. Father David, my companion during my stay at Baramous, was typical of an old-style monk with a 20th-century outlook. He does not live in one of the traditional dungeon-like cells so small that the occupant could not stand upright inside, but had to crawl in on all fours. He has two small rooms in an upper story overlooking the central courtyard which is cultivated as a garden and miniature orchard. He can sit of an evening on the balcony looking down on this tiny oasis where a few birds nest in the orange trees; or he can work in his front room at his hobby of watch-repairing. One of his rooms has been fitted up as a kitchen, for all the monks now prepare their own food, and meet for community meals in the refectory, with its long table hewn from a single slab of stone, only on feast days. The Father and I took late tea together in his rooms just as two bachelors might do in the middle of London, chatting about everyday affairs and looking over the photographs of his family. Other monks dropped in to share the tea and conversation. Later, as we walked on the ramparts to see the desert under a full moon, we were joined by a Father Ibrahim, who brought along a dish of dates culled from the monastery palms, the graceful trees whose dark green plumes are one of the first signs of life one sees on approaching the citadel of Baramous across the desert. Father Ibrahim offered me both dates and cigarettes, for smoking is not prohibited, and some monks smoke 30 cigarettes a day. Alcohol, however, is forbidden, except for a glass of wine on feast days. And so, listening to the murmur of prayers coming from some of the cells and looking out across the sand to the cliffs where Abuna Abd al-Masih was now standing with hands upraised praying outside his cave, I was struck by the curious disparity between what seemed like laxity on the one hand and extreme asceticism on the other. Inside the 40-foot-high walls, my two monkish companions appeared to be enjoying a pleasant and serene sort of life, while outside another monk was undergoing the severest conceivable penance. Both modes of spiritual services, however, are alike acceptable under the rules of Coptic monasticism, which has always left it to the wisdom of each man to work out his own salvation. Father David happened to prefer the security of the monastery, with his snug suite of rooms and a big table on which to set out the parts of the watches he was repairing and the tools he repaired them with. Father Ibrahim liked a smoke before retiring. Both liked to play with the monastery cat—a queen with two fat kittens now gamboling about in the garden. The fondness of the two fathers for the puss reminded me of the stories of how the first hermits shared their frugal rations with any animal that happened to drop in from the surrounding desert. In fact, Macarius, the founder of the monastery of Baramous, once looked after a litter of orphaned kittens in a cave not far from here; and the great Saint Antony himself, we are told, was always extremely courteous to wild animals. Thus, when he caught a gazelle eating the bean plants he had planted outside his cave, "he took hold of it gently and said to it, 'Why do you do harm to me when I do no harm to you? Go away, and in the Lord's name, do not come into my garden again.' And ever afterwards," says Athanasius's Life, "the wild animals left his garden alone." But strolling along the ramparts with Father David or taking tea with him in his rooms, I found myself continually thinking of the hermits outside the monastery walls, for these solitaries are the last survivors of a class of men who actually changed the history of the world. For the fact is that the original Egyptian anchorites were the founders of monasticism as we know it in the West; and no historian would deny that it was the monasteries of medieval Europe which were the principal, and almost the only, conservators of art and culture for almost six centuries. And the great monasteries of Europe were founded by religious leaders who were following the example of Egyptian hermits whose names are now almost forgotten—Paul, Antony, Athanasius, Pachomius, Shenouda. The idea of the cenobitic community was brought to Europe from Egypt by Athanasius and Jerome, while the rule governing such communities was first laid down by the Egyptian monk Shenouda. What the visitor to the Coptic desert monasteries is seeing today, therefore, is the birthplace of the most significant movement in Christian history, as well as some of the oldest shrines of our religion. There is not much left to see in the case of some of them. The huge fortress-monastery of Saint Simeon at Aswan is abandoned; the Red and White monasteries near Luxor are in a state of disrepair; and 46 of an original 50 convents in the Wadi Natroun have disappeared under the sands. All the same, cenobitic life in Egypt has continued almost uninterrupted for 1600 years, sometimes under the most appalling difficulties and during periods when the monasteries were sacked or burnt and their inmates massacred. The evidence of these calamities is still seen in the high walls and blocked gates of these remote citadels of Christianity, and especially in the massive keeps within the walls, the last refuge of the besieged brothers to which they could retire over a drawbridge when attacked. Yet all through these centuries of persecution and outright destruction, the monks continued to feed any passerby who asked for food. Their one concession to the hostility of the outside world was to lower food from the walls in baskets and to raise visitors in a net. Many a 19th-century traveler was hauled up over the ramparts in this manner. And even today, one enters the desert monasteries through a small postern-gate which is unlocked by a massive key; and after sundown, no one can gain admittance at all. So the Coptic monasteries of Egypt stand as the first models of Christian monasteries all over the world; and hermits like Abuna Abd al-Masih as the last descendant of the primitive saints from an age when saintliness was equated with the annihilation of all earthly vanities. I was told that the Ethiopian was in his cave during the campaigns in the Western Desert and that he was under fire during Rommel's advance on the Nile. We have no way of knowing what he thought about the experience. Judging by his contempt of the outside world and all its works, the probability is that he dismissed the bursting shells and the showers of shrapnel as another trick by the devil to interrupt his prayers and meditations. It is also reported that British GHQ in Cairo apologized to the hermit for any inconvenience caused him—an ironic homage of the 20th century to the third. James Wellard, foreign correspondent, lecturer and author, has written for The Times, Encounter and Holiday. Among his 12 books are The Great Sahara and Lost Worlds of Africa, both histories of exploration in the African deserts. This article appeared on pages 26-28 of the March/April 1970 print edition of Saudi Aramco World.